2 cups cooked garbanzo beans (or any white bean -limas, navy, etc.) Canned is OK if you rinse any salt or preservatives off of them. 1 teaspoon cayenne pepper (or more... or less) A great metabolic stimulant! Place all ingredients, except for olive oil, into processor and blend. After initial ingredients are blended well, with processor running, slowly drizzle in the olive oil. 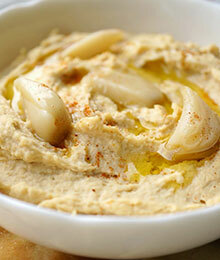 This makes a light and fluffy hummus. Serve with celery, carrots, bell pepper strips, romaine leaves, grape or cherry tomatoes, etc. Lots of fiber and protein to fill you up and stabilize your blood sugar levels. Yum!